Not so different, when you think about it.Welcome, dear readers, to the first in a brand-new series of articles. Here, we’ll be looking at concepts for Pokemon, asking questions about their designs, and learning about some of the surprising ideas behind some Pokemon. I’m IatosHaunted, and this is Concept Corner. Now, since Black and White came out in Japan, there’s been a lot of controversy and adversity towards a few of the new Pokemon. No, that’s not what this first article will be discussing. And this is not because I love all the new Pokemon(I just can’t get behind that stupid trash bag thing), but I want to save that for when Black and White come out in other areas of the world, so we all get to see more of the new creatures. Despite that, today’s article does involve bizarre, obscure, and bluntly stupid Pokemon designs. But the Pokemon we’ll be looking at are from the first three generations of Pokemon, because really, strange concepts in Pokemon are nothing new. There are just more of them this time around. Now, before we dive in, you may be wondering: “Why, mister new writer person, are you only looking at the first three generations of Pokemon? What about generation four?” Excellent question, little Timmy, and the answer is fairly simple. Generation four had a lot of great Pokemon, spawning many of my favorites. However, generation four has two problems. 1: Many of the new Pokemon in gen 4 were simply evolutions of older Pokemon, which I don’t want to use because there’s not much good writing material-at least, not for this topic-coming from them. 2: While there are a few Pokemon designs in gen 4 that I have a hard time agreeing with, they are mostly because of unoriginality, more than plain weird or stupid design. I assure you, these will be touched on in future articles, but for now let’s stick to what I said we would. So, we have three examples of strange designs in earlier generations to look at, so let’s get started! Okay, right off the bat, I do like these guys in-game. I think electric/steel is an awesome type combo. That said, however, you just have to wonder where this idea came from. In the original games, all the Pokemon had simple designs, and were very animistic. Mostly. These two are among the few exceptions. Magnamite is fairly self-explanatory. It’s an iron ball with a big eye, and spinning magnets on its sides that make an anti-gravity field, allowing it to float. 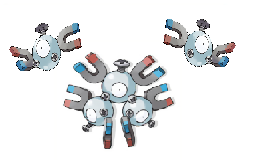 Magneton, however, is where this gets weirder. After looking at pokedex entries from all the various games, here’s the rundown of Magneton’s info. -Magneton is formed by three Magnemite linked together by magnetic forces. -Magneton often disrupts radio broadcast with its own garbled signals. These same signals also cause distortion on TV displays. -A Magneton’s magnetic and electrical discharge raises the temperature by 3.6 degrees F within a 3,300 foot radius. -Getting close to a Magneton will often cause severe earaches. -Magnetic waves generated by a Magneton will dry up any moisture around it (presumably within the same radius as the tempature rise). These same waves cause fatal damage to mechanical devices and machinery. -Magneton often appear in large numbers when large numbers of sun spots occur. -Large enough groups of Magneton can cause large-scale magnetic storms. So basically, these things are doomsday machines. They disrupt machinery, radio and television broadcasts, and even the environment. Their very existence messes stuff up. This brings two questions. 1: How have these things existed without accidentally destroying the world, and 2: How are these classified as animals? Wobbuffet is an interesting case. It is classified as “the patient Pokemon”, and…that’s pretty much it. No one’s sure where exactly the concept for it originates. One popular theory is that Wobbuffet is based on the concept of karma, due to the fact that it’s limited move set makes this Pokemon unable to attack the opponent without being attacked first. (This could also explain its typing) Other concepts include basis on a punching bag, based on its form and move pool, and even derivation from Japanese comedian Sanpei Hayashiya, who’s trademark was to hold his hand to his head like a salute during his act, as part of his delivery. Wobbuffet is a Pokemon whose weirdness is all based on its mysteriousness, which is pretty cool in itself. It’s not exactly a stupid design, just a really, really, really vague one. Even its pokedex entries yield very little, only that is has a fear of harsh sunlight and keeps its tail hidden. I think I speak for us all when I say it would be good to find out more about this creature. I wish there was more to say about it, and hopefully in future generations there will be. Hoo, boy. Loudred. If you’re fairly new to Pokemon, you may look at this guy and not know what the problem is. So let me just explain it. Loudred’s ears can act as loudspeakers, expelling large amounts of sound. That is the EXACT OPPOSITE of what ears do. Furthermore, Loudred’s loud bellows come from its mouth, not its silly not-ears, so what is even the purpose of having loudspeaker ears? Is it just so Loudred can blast music from its iPod really loud? I like the Whismur evo line, but I’ve never been able to get past this. It’s just one of those cases where it makes less and less sense the more you think about it. So there we have it. I’m not meaning for this to be any attempt at rationalizing the bizarreness of some new Pokemon, but rather stating that obscure, bizarre, and sometimes just plain stupid concepts are nothing new to Pokemon. Next fortnight(two weeks from now), we’ll be addressing the other side of the argument, looking at some perfectly good Pokemon concepts that would have been very well-received, and which remain unused, while we have chandelier and ice cream-based Pokemon. Thanks for reading, hope you enjoyed. See you in article #2!